and displayed an early interest in skating. He learned to skate on the Ninth River near his grandfather's farm in Canning, Ontario, Canada, and at public rinks on weekends. But it was the rink his father built for him behind the little house on Varadi Avenue in Brantford that became known as the birthplace of his skating skills. Gretzky was only six years old when he saw his first year in organized hockey. He scored one goal, the lowest yearly total of his career. Already Gretzky had mastered a unique skating stride. His dad's advice to "skate to where the puck's going to be" helped him score 196 goals in seventy-six games at the age of nine. Gretzky's father pushed his son to succeed and told him that the years of hard work would pay off when he became a successful hockey player. As a sixteen-year-old in the Junior "A" league, Gretzky continued his high scoring and packed the arenas with fans eager to witness his skills. He wore number 99, because number 9 was still being worn by his idol, Gordie Howe. His slight build led one junior coach to suggest he pick an offensive position, where he could avoid body contact. This was the beginning of Gretzky's trademark spot: behind the opponent's net. In 1975 Gretzky moved to Toronto to play for the Young Nats, where he won the league's rookie of the year award. Two years later the Sault Ste. Marie Greyhounds drafted him, and he again won rookie of the year honors. Gretzky had gone to school in Brantford and continued high school classes in Sault Ste. Marie but left before graduating. In 1978 Gretzky turned pro with the Indianapolis Racers of the World Hockey Association (WHA). Less than two months later the Edmonton Oilers of the same league purchased his contract, signing Gretzky to a twenty-one-year contract. In the 1979–80 season the Edmonton Oilers were admitted to the National Hockey League (NHL). In his first year in the NHL Gretzky scored fifty-one goals, eight more than he had scored in the WHA, and he made the second All-Star team. He won his first Hart Trophy for most valuable player, and he won the Lady Byng Trophy for his sportsmanship and skating ability. Taking the public by storm, Gretzky's polite charm was the perfect foil to the traditional rough-edged hockey player. He went on to become the first player to win the Hart Trophy for eight years in a row, from the 1979–80 season through the 1986–87 season. Despite Gretzky's talents, the struggling Oilers remained at the bottom of the league. In his second year he led the league in assists and points, made the first All-Star team, and won his second most valuable player trophy award, but the Oilers lost in the quarter-finals to the New York Islanders. During the 1981–82 season he continued to break records, including some of his own. He scored fifty goals in thirty-eight games, breaking Maurice Richard's (1921–2000) record. And on February 24, 1982, he broke Phil Esposito's (1942–) single season scoring record. But the Oilers had not yet made it past the first round of the playoffs. In the 1983–84 season, however, the Oilers won their first Stanley Cup. The two subsequent seasons ended with the Oilers taking the Stanley. In the summer of 1988 Gretzky was traded to the Los Angeles Kings. He quickly turned that weak team into one of the best. Gretzky, a left-handed shooting center, developed a style that was as distinctive as it was exciting to watch. Listed in the program as 6 feet and 170 pounds, he always stayed away from fights, preferring to drift and glide around the ice. Some fans believed that he viewed the rink as a chessboard and that he had the ability to sense where the puck was going to end up, thus skating to that position. Others believed that his greatest asset was his ability to move sideways across the ice at full speed. But it was his assists that made him especially valuable to his team. In becoming the leading scorer in NHL history he set a new record for assists (more than thirteen hundred) in just twelve seasons. In 1989 he passed his idol Gordie Howe's all-time point record of 1,850. Such achievement brought Gretzky numerous commercial endorsements for companies as different from one another as General Mills and Nike. Consumers found his personality appealing, and he only endorsed products he used. Advertising Age Magazine called him "an ideal athlete to endorse products." 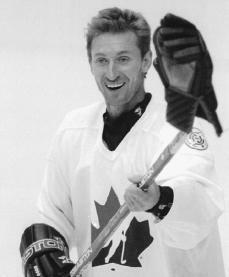 Gretzky continued breaking records and winning awards in the 1990s. Late in the 1993–94 season he broke another Howe record of 801 career goals, accomplishing this in 650 fewer games than Howe played. Gretzky began to get frustrated with the unsuccessful attempts of the Kings, and he wanted to be traded. Gretzky was traded to the St. Louis Blues in the 1995–96 season. Gretzky's career with the Blues was brief. He had not yet officially signed with the team when they lost the first two games in the playoff series. The coach and general manager of the Blues blamed Gretzky for the losses, but Gretzky had already decided not to sign with St. Louis. Instead, he signed with the New York Rangers for the 1996–97 season. Gretzky retired from hockey in New York in April 1999. He left the game after twenty years as a professional in the sport, with sixty-one NHL records held or shared. His number 99 jersey was permanently retired at ceremonies during Gretzky's final game with the Rangers. Gretzky was inducted into the Hockey Hall of Fame in November 1999. The crowning achievement in Gretzky's hockey career came at the Winter Olympics of 2002 as executive director of Canada's hockey team. A Canadian ice worker embedded a lucky "loony," Canada's one-dollar coin, in the hockey arena's ice. Perhaps that's why the Canadian team won over the United States, 5 to 2. It was the most watched game in the history of hockey, with thirty-eight million homes tuned in. The final goal was scored with the sound of "O Canada," Canada's national anthem, in the background. Currently Gretzky is part owner of the Phoenix Coyotes. He lives with his wife and four children in the United States. Gretzky, Walter, and Jim Taylor. Gretzky. Toronto, Canada: Random House Canada, 2001. Podnieks, Andrew. The Great One: The Life and Times of Wayne Gretzky. Toronto, Ontario: Doubleday Canada, 1999. Rosenthal, Bert. Wayne Gretzky: The Great Gretzky. Chicago: Children's Press, 1982. Wilker, Josh. Wayne Gretzky. Philadelphia: Chelsea House, 1997.